An idea that started in a garage five years ago has led a group of entrepreneurs from Chandler, Arizona, USA, to Hanoi, Vietnam, in hopes of landing what could be millions of dollars in sales of mobile data centers to the former U.S. enemy that now wants to rapidly expand its digital infrastructure. Joe Robbins, president of Elliptical Mobile Solutions, shows off the C-S.P.E.A.R., which provides cooling and storage space for Internet servers and other electronics equipment. Elliptical Mobile Solutions' co-founders, Simon Rohrich and William Woodbury, and Chief Executive Bill Stockwell will make presentations Thursday to about 200 Vietnamese business and government leaders at the Vietnam Internet Network Information Centre building in Hanoi. The company hasn't signed any contracts yet, but Vietnam's technology and communications ministry has effectively designated Elliptical's system as the platform it will use as the nation expands its Internet and IT networks, Rohrich said. Because there are no local suppliers of similar equipment, he thinks the coast is clear for the Chandler company to score major contracts. "Normally it would take years and years to build buildings to house this equipment," he said. "Using our system they can rapidly build and scale to their needs. It is ideal for emerging markets." The Chandler trio will be accompanied in their presentations by officials of Dot VN, a San Diego company founded by Vietnamese nationals that is serving as Elliptical's distribution and marketing agent in Vietnam. "With the quickly growing economy in Vietnam, IT needs are significantly increasing as well," said Dot VN CEO Thomas Johnson. "Our exclusive right to sell these solutions in Vietnam and nonexclusive right to sell throughout Asia allows us to capitalize on the current economic boom in the region." 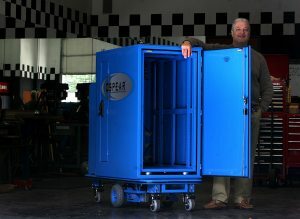 Elliptical's "data center in a box" is a steel enclosure that hold racks of servers and other electronic gear. The cases are designed with suspension systems to absorb vibrations, provide their own energy-efficient cooling and can be operated in groups as the customer's IT needs expand. They sell individually for $35,000 to $140,000. Rohrich touts the system as far cheaper than constructing a building with elaborate cooling systems to house the electronic equipment. Elliptical's centers just require a concrete slab and electrical and phone-line connections. Two smaller versions also have wheels attached for easy mobility. "Our way of building data centers costs half as much and uses one quarter to one half the electricity," Rohrich said. In addition to being ideal for enterprises in developing countries, the systems are useful for military operations because they are shock- and vibration-resistant, he said. Elliptical officials hope to find other markets in Asia among countries that want to upgrade their IT infrastructures cheaply, and Stockwell will be visiting Singapore and Shanghai after the Vietnam appointment. The company has already found customers in the United States. The city of Avondale uses one of the company's smaller units as a portable emergency operations center, while the Hopi nation in northern Arizona purchased a unit to operate its court system, Rohrich said. The company was started in August 2005 by Rohrich, Woodbury and Phoenix resident Joe Robbins at Robbins' home near 19th Avenue and Thomas Road. The founders were able to raise money from angel investors and secured four patents on various aspects of the system. Other patents are pending. The rapidly expanding company moved to Chandler about a year ago. Elliptical does all of its manufacturing in the U.S., resisting the temptation to outsource to foreign countries. The company currently employs 14 people at its Chandler headquarters, 465 E. Chilton, and Rohrich said that number will increase if anticipated orders materialize. "We have survived the recession," he said, adding that "it's not easy to start up in times like these."